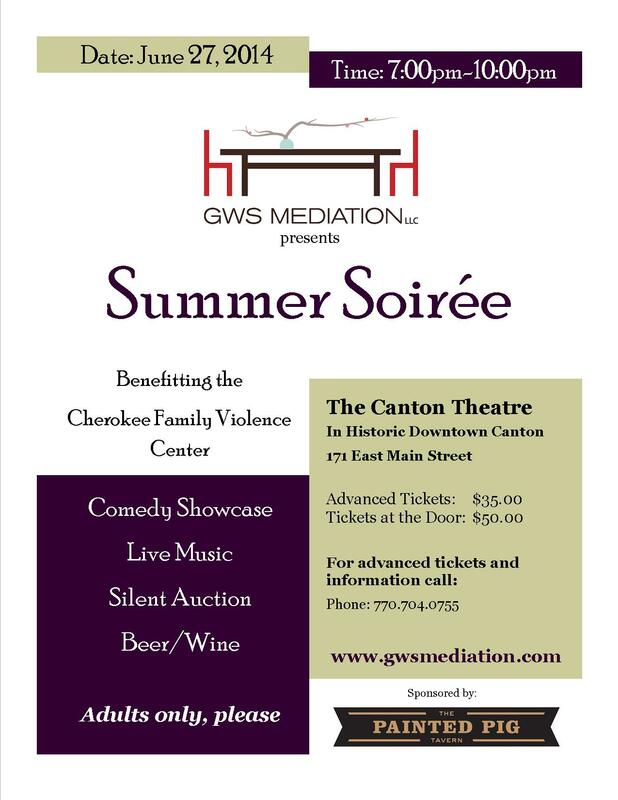 GWS Mediation, LLC, a local company specializing in alternative dispute resolution, is hosting an event benefiting the Cherokee Family Violence Center on Friday, June 27th, 2014. GWS Mediation, LLC provides neutral mediators to assist parties in conflict resolution in an effective and informal setting. The Summer Soiree will take place 7-10 p.m. at the Canton Theater in historic downtown Canton. The event will offer guests a variety of entertainment, including a comedy showcase, live music, silent auction, and beer and wine. Tickets purchased in advance are $35, or $50 at the door. If you would like to donate to the silent auction or to Cherokee Family Violence Center (CFVC), please contact Michelle Gaudet at 404-936-0720 or michelle@gwsmediation.com. CFVC assists victims of domestic violence in Cherokee County by providing emergency shelter, crisis intervention services, affordable housing, and education and support services. For almost 30 years, the Cherokee Family Violence Center has provided safety, support, and shelter for victims of domestic violence and their children that live in Cherokee County, Georgia. Currently, the CFVC provides shelter and services to over 120 victims in our area.